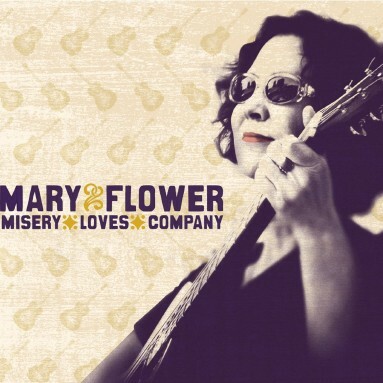 An artist whose mastery has elevated her to the highest ranks of roots music, Mary Flower is celebrated for her instrumental skills and engaging vocal style. Her new Yellow Dog Records release, Misery Loves Company, finds Mary hosting eleven musicians who join her for a series of duets. Along with Mary’s dazzling guitar and unmatched lap steel, the record features empathetic performances from some of blues and roots music’s most accomplished practitioners. Mary’s fourth Yellow Dog release is a stripped-down collection of a dozen songs. Calling upon the talent pool in her home town of Portland OR, she sat down with ten instrumentalists — and one singer — to make her most intimate record to date. Misery Loves Company features a staggering variety of great players, from jazz pianist Dave Frishberg to multi-instrumentalist Colin Linden. It’s a testament to Mary’s ability to bring out the best in her collaborators.